The utility room is fairly big – 2.3m x 3.8m – but there is a lot of kit to go in here. 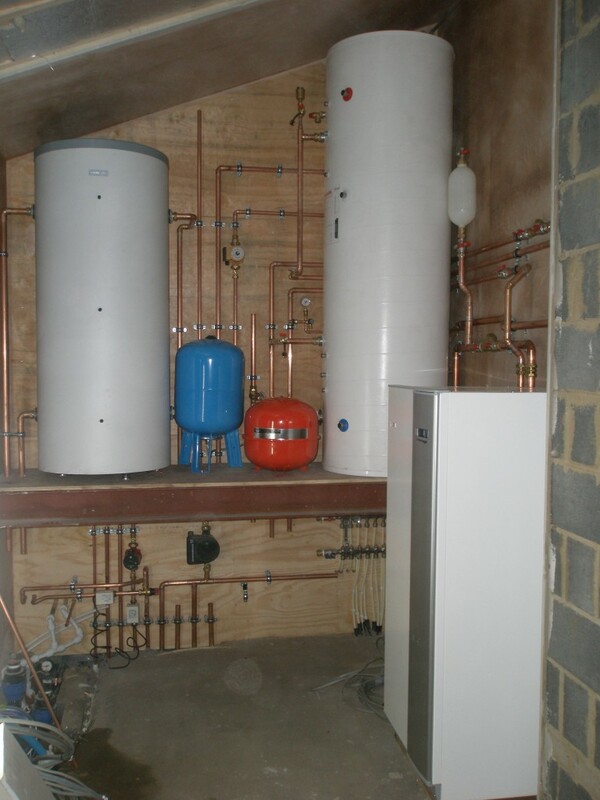 Two cylinders for the ground source heat pump, under floor heating manifold, pump module and the ground source heat pump. The layout suggested by the ground source heat pump installer would have effectively converted the utility room into a plant room. We realised early on that there was significant height in this part of the extension and therefore decided to raised the two cylinders up onto a platform so that the underfloor heating manifold and pump could be installed underneath them. This reduces the amount of space required in the utility room to install this kit. 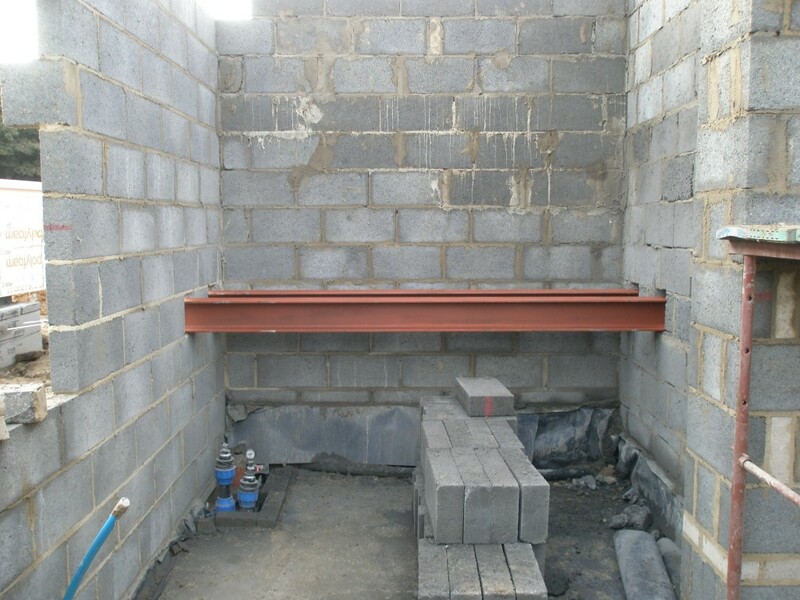 The steels that will support the platform for the cylinders were installed this week. 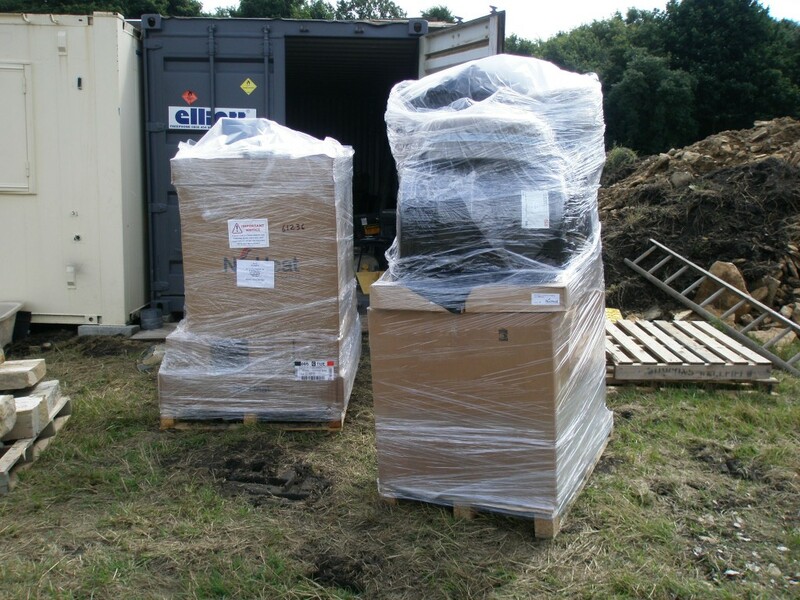 There is a lot of kit to go into the uitlity room that relates to the ground source heat pump. By putting some steel beams into the utility room we can raise two of the water cylinders up and put additional kit underneath the cylinders. With the underfloor heating installed, it is time to lay the floor screed. This is a semi-dry mix. There were two deliveries during the day. The photo below shows the first delivery of 10 tons, the second delivery was for a further 6.5 tons. 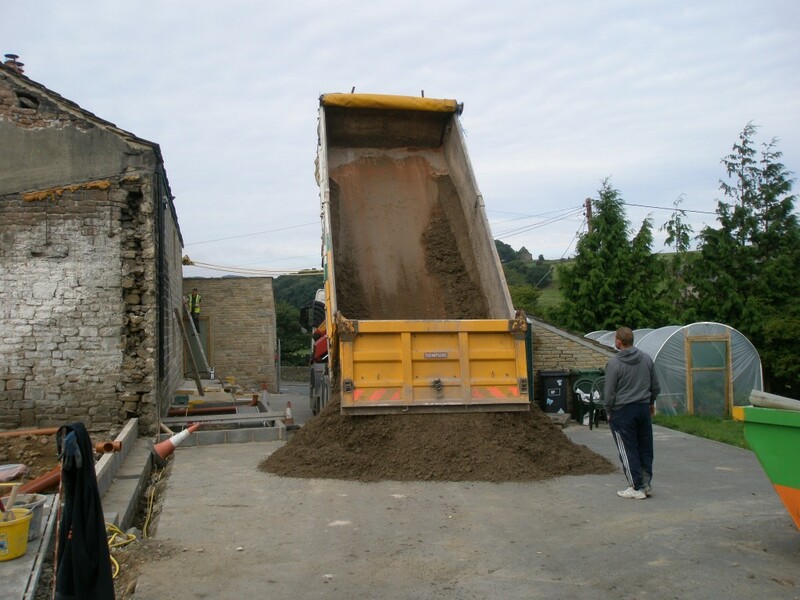 The screed was intended to be 70mm thick, but the existing floor was not level so it varied for 70mm to 100mm in places. The end result was a perfect level floor. The downside is that it used more screed that expected, but we still had a enough. The floor was laid in one day – admittedly, a long day. It takes 48 hours for the screed to go off, so we won’t be able to walk downstairs until Friday. So we have had to reorganise work for the next couple of days. With the underfloor heating installed, it is time to install the floor screed. The underfloor heating is now installed upstairs together with the first fix plumbing for the bathrooms. The insulation has been installed downstairs. 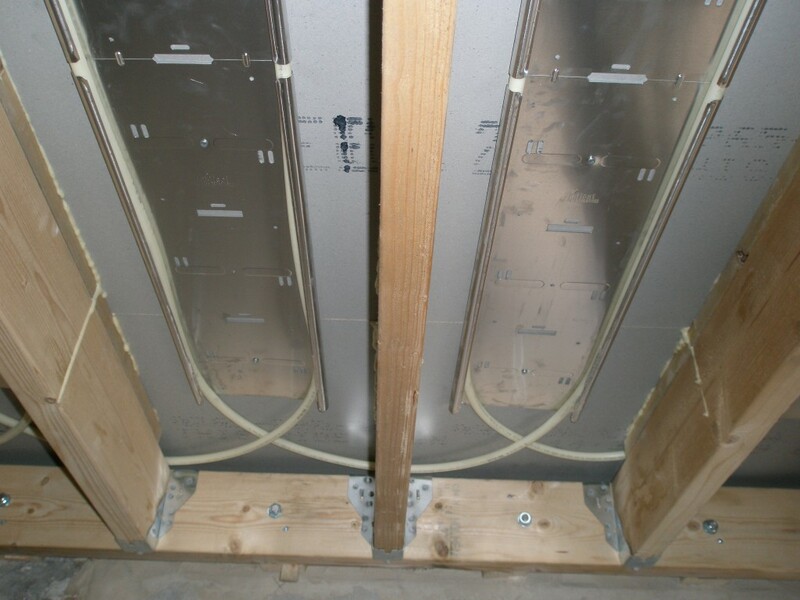 The insulation consists of large slabs of expanded high density polystyrene that is foil backed. It is 50mm thick and is cut to size using a wood saw. Once it is down, it can be walked on. A strip of expanded plastic is put all around the edge of the room. This forms a gap between the edge of the screed and the wall. 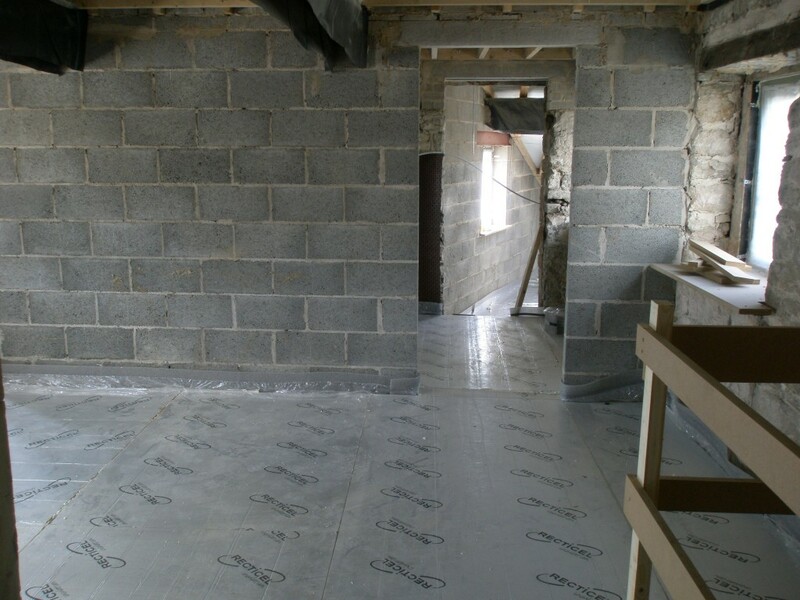 This allows the screed floor to expand and contract as it heats up and cools down. Without this, there is a possibility that the screed would expand with the heat, push against the walls and crack. The screeders are booked for Tuesday morning. 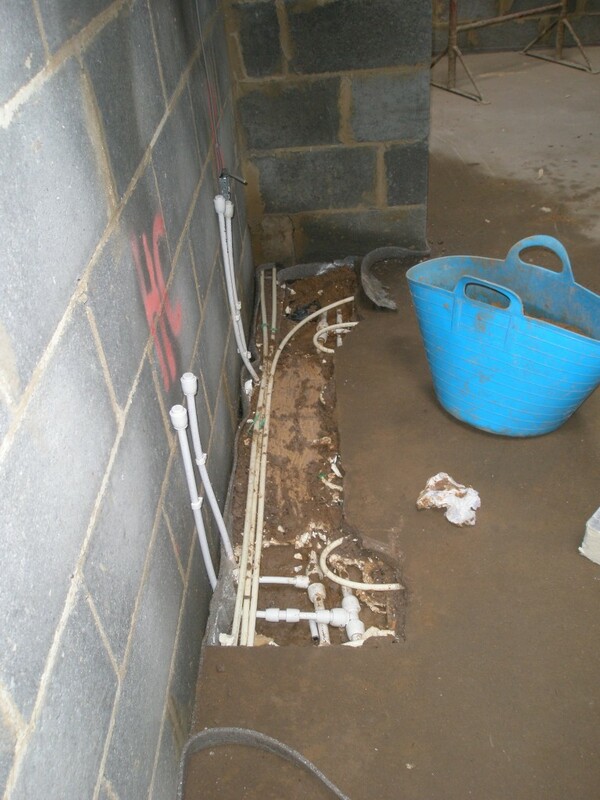 By then all of the pipework needs to be clipped to the insulation, so that 70mm of screed can be laid on the floor. It will take a day or so for the screed to go hard. During this time, no one will be allowed inside the house. While the house is out of bounds, we will install the ground loops for the ground source heat pump in the field. 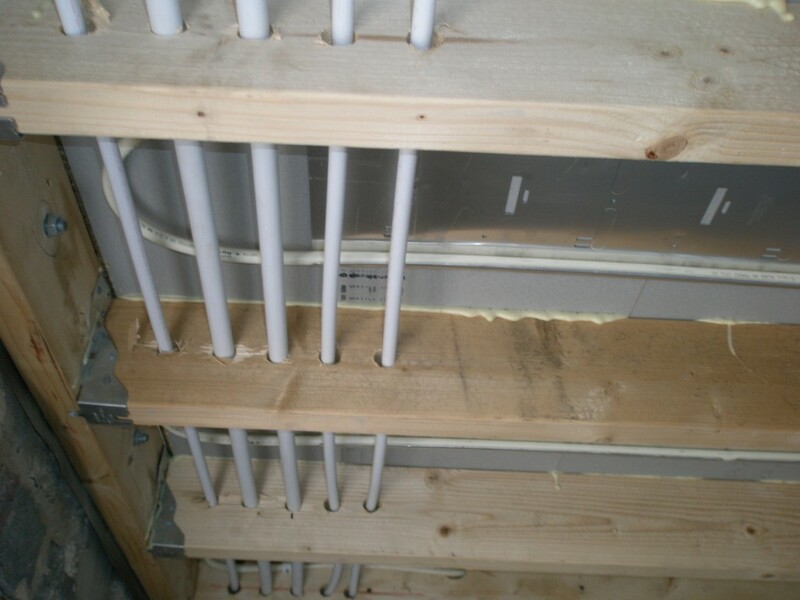 The underfloor heating has been installed upstairs together with the “first fix” plumbing. 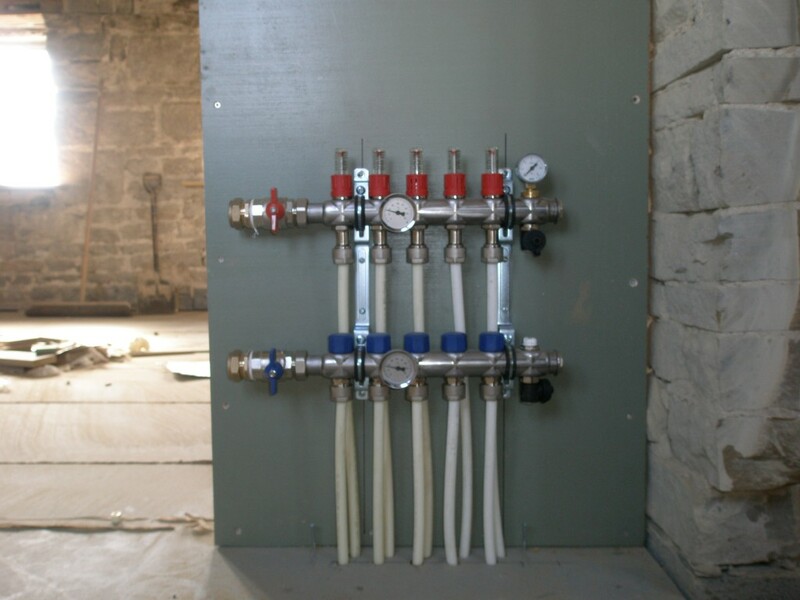 This means that all the hot and cold water pipes have been run to each of the bathrooms as well as all the drainage. We have used the same installer for the underfloor heating and the first fix plumbing to make life easier. 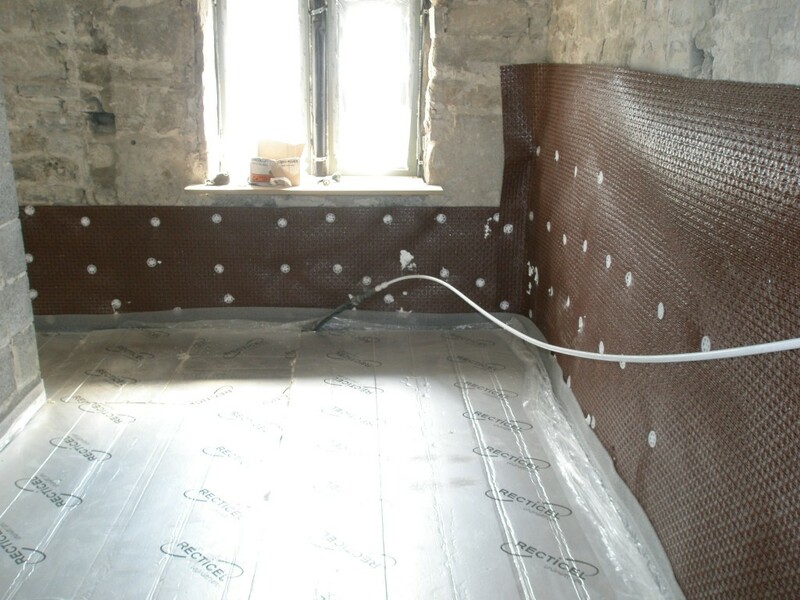 The insulation is down and we have put a damproof membrane on the inside of the walls. This end of the building has had some damp problems in the past so we want to be a 100% sure these problems are fixed moving forward. The white pipe is the main water supply for the property and we have temporarily located it to a tap outside while this work is going on. Just the pipes to be installed downstairs before the screed can go down on Tuesday. The insulation is down on the floor. The damproof membrane has been fixed to the walls. There will be two large doors here that open on to the courtyard, but for now we have boarded one up and put a temporary door on the other. 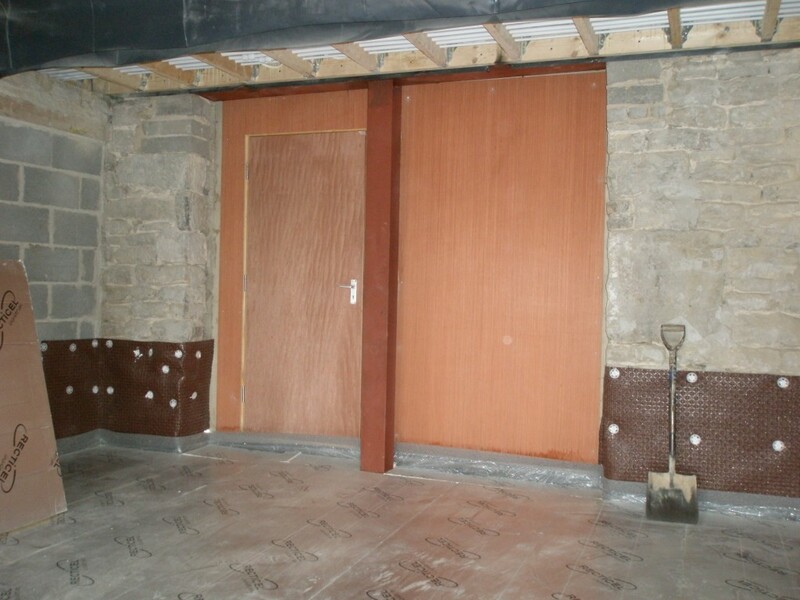 If we put the “real” doors on now, they would only get damaged during the building work. 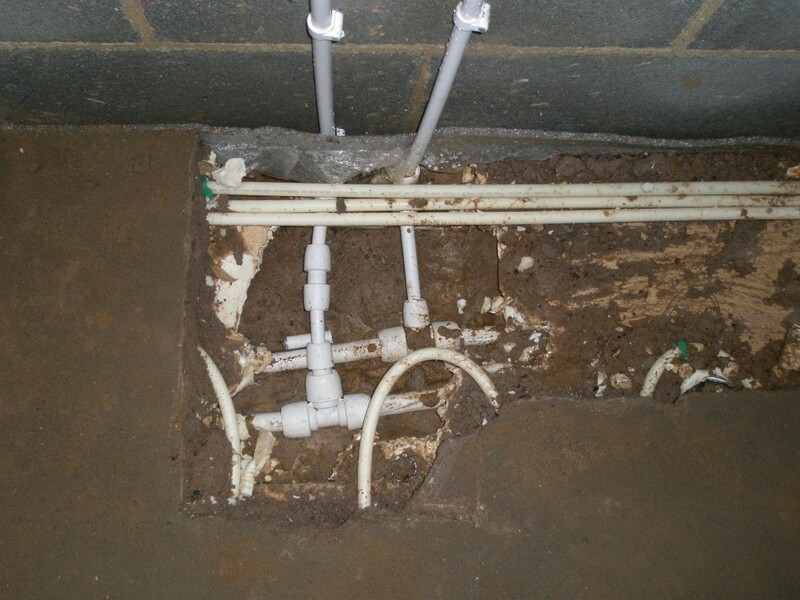 The pipework has been installed in the underfloor plates that were installed. It seems strange to think that this is going to heat the upstairs of the house. It hardly seems enough, but when you think about it, these plates are really just a massive radiator – albeit installed under the carpet. The first floor bedrooms will have carpet and it is possible to install “low tog” underlay and carpet that will help transmit the heat through the floor. Often underfloor heating is associated with solid floors, however, I am assured that it works well with both timber and carpet. We will just have to see how it works. All of the pipework for the underfloor heating upstairs has now been installed. Tomorrow our attention will turn to the underfloor heating downstairs. This has been installed on a temporary piece of plywood since the cupboard that will hold this manifold still has to be built. 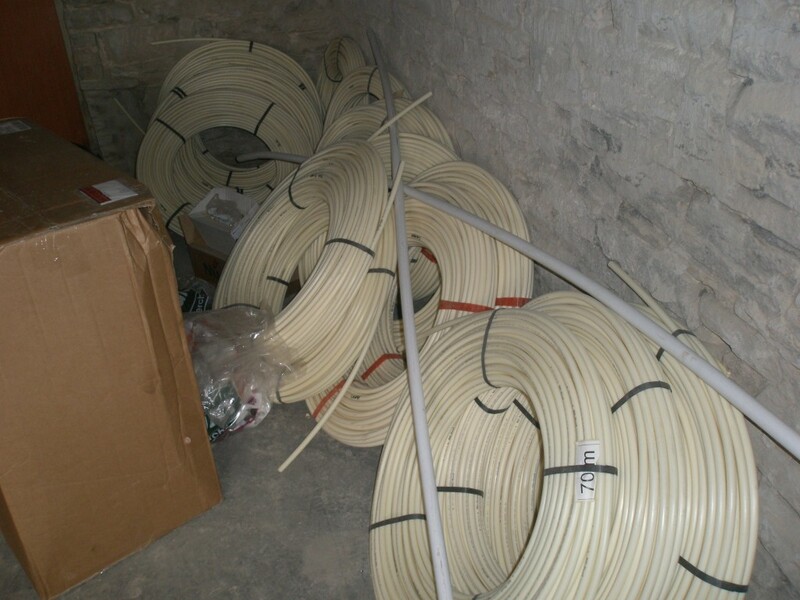 If you think this looks like a lot of pipe, it is just for the downstairs (the upstairs is already installed) and in only half of the property. We made a start today on installing the underfloor heating. We are installing this throughout the building – both upstairs and downstairs. 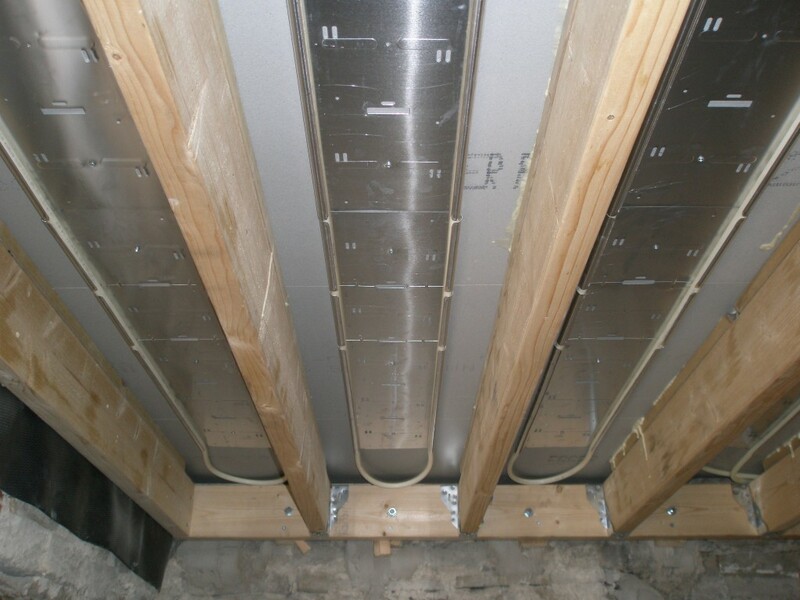 The upstairs heating works via a system of metal plates that are fixed to the underside of the floorboards and heated by a set of water pipes. We left a 25mm gap between the large oak beams and the floor joists to make installing the plates a little easier. 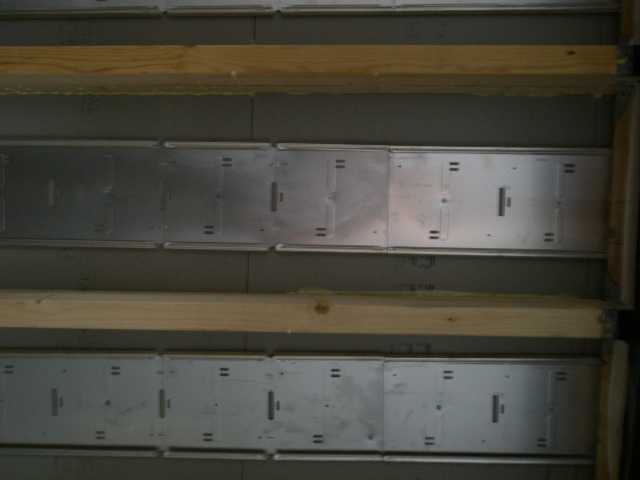 We have also cut out notches in the joists before the floors went down to make it easier to run the pipework. All in all, it only took a day to install all of the underfloor metal plates. 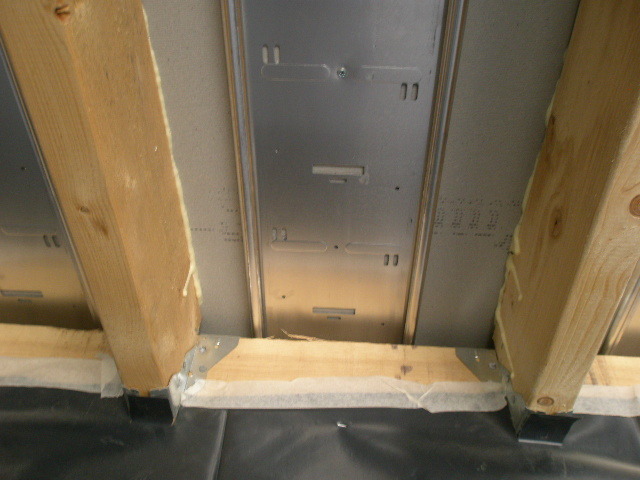 This shows the ceiling from below and shows the metal plates that have been fixed to the underside of the floorboards. The flow and return pipes will be installed later. This shows the metal plate screwed to the underneath of the floorboards. The flow and return pipes get clipped into each side later. After the first fix electrics and plumbing have been installed, insulation will be put between the joists and the ceiling will then be plasterboarded. You can see the 25mm gap we left over the top of the big oak beams to allow the plates to be installed. This is due to be installed next week, but the kit has arrived today. We are going to be spending the next few days sorting out the existing floor so that the underfloor heating can be installed directly on top of it. The underfloor heating is going to be fitted next week and the kit has arrived ahead of the installation.